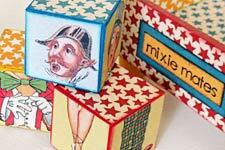 Inspired by vintage childrens blocks (and split-page books) where you can rearrange the heads, torsos and legs to make funny combinations. 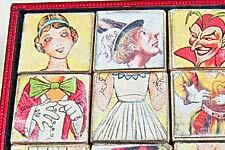 Note: the top 2 rows of figures are 1" x 3" so fit 1" wooden cubes (the figures in the bottom row are various widths but all the heads are the same height so could be used in a book or other collage project). 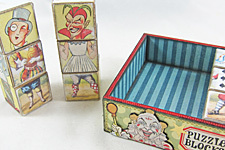 Circus Puzzle Blocks by Kristin Batsel. See the Supply List. 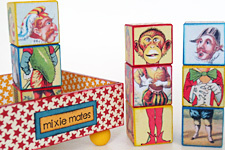 Mixie Mates Blocks by Shannon Cooper; See the Supply List.